Comfortably sized guitar with beautiful tonewood that also looks amazing too. There's something undeniably inviting about the Taylor GS Mini's scaled-down size, yet a single strum reveals the impressive voice of a full-size guitar. That mix of portability and musicality has proven to be a winning combination that fits into so many scenarios in life, from the couch to the campfire to the concert hall. It's not too big. It's not too precious. It's not too expensive. That broad-based accessibility has given it a resounding universal appeal, not to mention a built-in fun factor. The shorter 23-1/2 in. scale length makes forming chords a breeze yet gives the instrument plenty of snap and tuning stability for a rewarding playing experience. 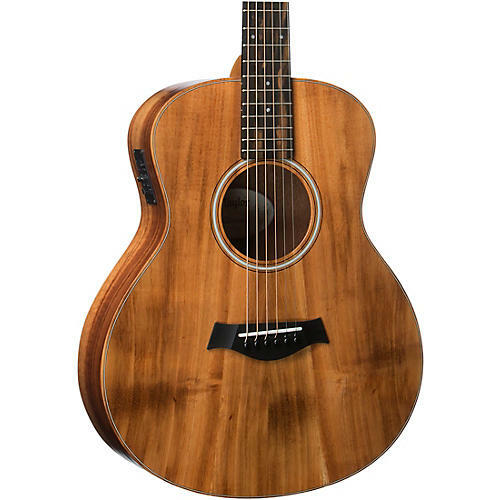 The acoustic-electric versions, like this GS Mini-e Koa Acoustic-Electric, come with Taylor's reliable ES-B electronics. All GS-Mini models include a durable hard bag built by Taylor for the optimal fit. A guitar's top is the primary filter and distributor of vibrating string energy through the guitar, which means it has a huge impact on its sound. The GS Mini-E Koa features solid Hawaiian Koa, a hardwood that produces a natural compression, yielding more of a controlled "roll-in" effect to a note. The compression evens out a lively attack for a more balanced response. It delivers strong fundamentals with clear and direct focus - similar to mahogany - but with extra top-end shimmer and chime. The arched back of the guitar generates more sound from a small- bodied instrument, and using layered wood back and sides create a sturdy yet receptive platform for the vibrating string energy sent by the guitar's top. Layered wood is also less succeptible to changes in temperature and humidity, making it an excellent choice for players who travel with their instruments or simply require more durability. The GS Mini-e Koa is amplified via the Expression System Basic (ES-B) system, which incorporates piezo design elements from the flagship Taylor ES2 system. It's powered by an onboard preamp that includes a built-in digital chromatic tuner, an LED display for tuning and low battery indication, and Tone and Volume controls. The preamp/tuner is powered by two button cell 3v lithium (CR2032) batteries. Two new batteries will provide approximately 300 hours of use. The ES-B conserves battery life using a standard on/off system that will automatically turn off if left on over 3 minutes. A low battery indicator on the LED display (located on the preamp circuit board) will display an “L” when the battery reaches 4.5 volts. Mini guitar at a mini price. Get yours now. Order today.